Two months after being crowned the FIM Supersport 300 World Champion, Ana Carrasco (DS Junior Team) is still continuing to attract a sensational amount of media coverage from big news outlets all around the world. Becoming the first woman to win a world title, she is certainly getting the praise she deserves. Featuring on all the largest news outlets in Spain throughout September shortly after she won the title, the coverage then spread throughout the world. From Marca in Spain, to El Pais to Ouest France, to the Italian La Gazzetta dello Sport, Carrasco has been featured all over Europe. And it’s not even just news articles, she has been interviewed for feature articles in well known and highly regarded outlets. British newspaper The Guardian have written about Carrasco’s feat on multiple occasions, most recently in this last week with a feature interview. Titling the interview “Ana Carrasco: ‘Women don’t just have to be grid girls – they can race too”, the British paper delves into the beginning of her career, how she started out in Moto3™ and the struggles she faced as a woman in a male dominated paddock. Offering more context into her amazing achievement, the Spanish youngster has become more accessible all around the world. 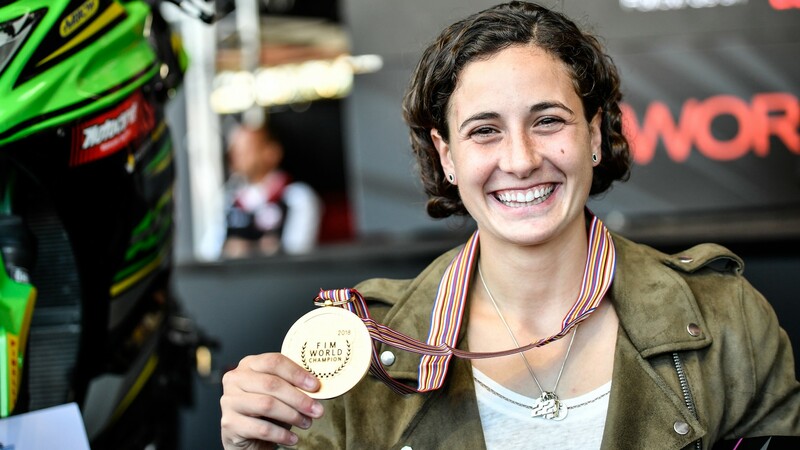 The rollercoaster is still going for the Murcia-based rider and it’s one she won’t be stopping soon as she becomes a role model all around the world. Re-live some of the stunning action from her history making season with the WorldSBK VideoPass.